Of, course it always cheers a news editor when a story has what we describe as ‘legs’ therefore it, erm, runs. Ah, the pleasure, the joy – a big news story that runs and runs, that is played down by some of our journalistic colleagues, saying ‘it’ll never happen’, only to be confirmed by the Home Secretary. As we saw in the Queen’s Speech, anti-social behaviour – a phenomenon that I believe to be a genuine worry that is also being fed by a lot of scare stories – is the political theme of the moment. 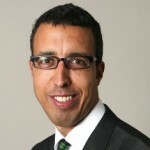 Kamal Ahmed is an American comedian and former member of the Jerky Boys prank phone calling group. He has acted in and directed several films, including Rapturious, completed in 2006.